ALABASTER, Alabama (January 31, 2019) — A couple of years ago, Alabama car collector Chip Pearce decided that aficionados of antique cars, muscle cars and other “collector cars” should be able to get them sold without having to ship them across country to the big national auctions. As one of the nation’s leading online auctioneers, he had an idea. He created BidWinCruise.com, which allows owners to consign their cars, have them professionally marketed, and sell them online while they are still sitting in the owner’s home garage. The concept had caught on, drawing buyers and sellers from throughout the country who are using his bidding platform and website. Pearce’s current online auction features 60 cars, trucks, motorcycles and even a couple of boats. “We have an ultra-rare Pierce Arrow and 12 pre-war classics from the 1920s and 1930s. 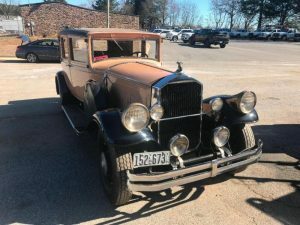 It includes classics from private collectors, estates and car museums in Alabama, Mississippi, Tennessee and Georgia,” said Pearce. “Collectors have jumped on the concept because in the past, many had to ship their cars to the big classic car auctions like Barrett-Jackson or Mecum. Those are great events, but it can cost thousands to ship a car to them for an auction, then ship it back if it doesn’t sell. With BidWinCruise.com, sellers almost anywhere can keep their cars where they live, show them locally, and get them sold,” he said. Services include appraisals and expert evaluations. Pearce will have some of the cars in his BidWinCruise.com booth at the Birmingham World of Wheels event Feb. 8-10 at the Birmingham-Jefferson Civic Center. The auction will end on Friday, Feb. 15. “This opens up a much wider market for smaller and regional collectors who are more comfortable having their car in an auction of a few dozen rather than hundreds,” said Pearce. Individuals seeking to buy or to sell in future auctions may visit the web site or call 205-664-4300. BidWinCruise.com is a division of Pearce & Associates Auction Company, based in Alabaster.